I’ve had a fair few chats with fellow tweeters lately about the different, or similar, ways in which we write and how we develop character, which has prompted me to write this post. When I think about my writing, most of it is character driven and plot considerations come later. This may or may not be the best approach – how can we tell? – but it’s the way I tend to write. My thoughts are that you need to know your characters inside out. If you don’t, they will appear two-dimensional and your lack of insight into them will trip you up in your plotting later. I am saying this from my own experiences when I used to just go with the flow and then found that plot lines weren’t hanging together properly. So I now tend to work by developing my characters early on, because by the time I know my characters, I know how they will behave, what they will say and how they will respond, and the ‘idea’ I have can then be properly plotted according to the characters’ personalities. – draw them, and if I’m not sure where to start with them, I think of someone I know who is similar to the person I want my character to be. – do an index card for each character, listing: name, hair colour and type, eye colour, clothes worn, likes, dislikes, favourite food, interests, brothers, sisters, mum, dad, grandparents (or absence of any of these), animals, relationships with friends, where they live, what sort of house they live in, age and birthday. You can add your own bits, anything to personalise and get to know your characters. – think about my characters’ back stories, as I know their past will affect them. – think about my characters ‘strengths and weaknesses and what are their flaws are. – ask my characters questions: do they have their own bedroom? Do they read? What books do they like? What would they do in this situation? How do they feel about this person? Do they like Christmas? If not, why not? It could be that there’s a reason for this that will form part of one of the plot lines. It is time consuming doing this, and I know sometimes I just want to rush in with the words, but I also know that the words I write will be a whole lot better if know my characters first. With the first Ruby and Grub book, the Ruby and Grub characters were in my head first. 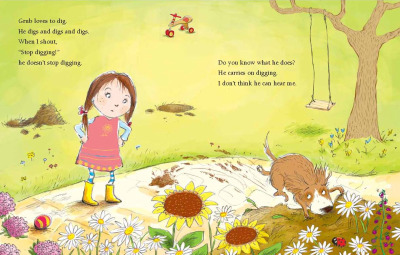 I knew I wanted Ruby to be sweet, loving and kind, but also sensible beyond her years, and I knew that Grub should be a mischievous and grubby pup. This meant that there was this pull between the sensible, kind little girl and her not very sensible dog. I had no idea of the plot until the characters were defined – after that, the stories almost wrote themselves. I did a similar thing with another story I wrote, which didn’t get published, about a bear/dog called Bengo that I owned as a child. Before I did anything else, I painted a picture of him from memory. By doing this, I felt like I got to know him all over again. I remembered the affection I had for him and could see the type of character he was – shy and a bit scatty, a kind of bear/dog version of me as a child. Once I had identified his character and given him his own voice, he could then be placed in almost any situation. I am now working on my first YA novel (Yikes!) and had an idea for the plot, which I knew was going to be much more complex than anything I’d previously written. I had an initial splurge of ideas, but could see that they were all over the place and that I didn’t know enough about my characters to carry on. I then spent about 3 weeks just on character development. I now know what my four main characters look like, what their bedrooms look like, their back story, their flaws, so I know how I want them to develop throughout the story. I suppose the best way to express this is that I know where I want them to be by the end of the book. It helps me to draw even the small details out, and I find myself drawing maps of where things are in relation to each other, so that I can work out how long it will take a character to get from one place to another, and I think about who the characters might pass on the way, what they look like, what their gardens look like. I often think that a lot of my books are like tv programmes or films in my head. 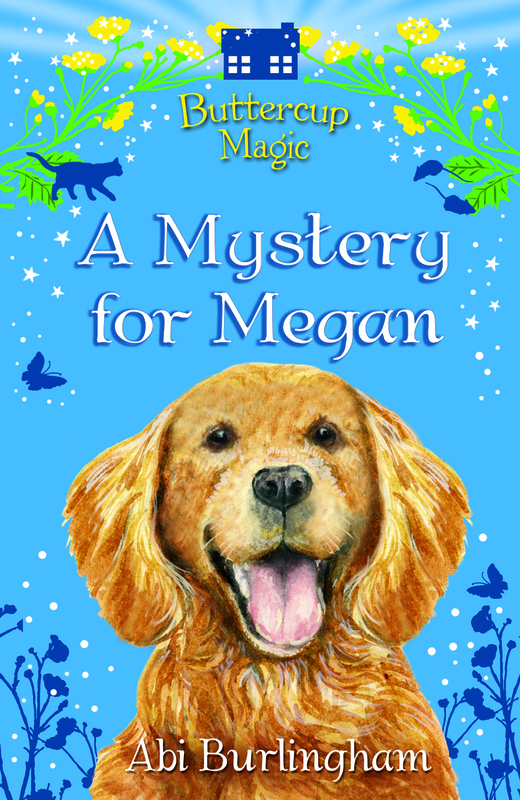 In Buttercu p Magic: A Mystery for Megan, which comes out in April 2012, the initial idea came from a vivid dream. After that, I did a lot of character development for two of the main characters in the story, Megan and Freya. But , I slipped up here by not asking enough questions of the animals, Buttercup, Dorothy and the mice, in the early stages. This was especially important as there is a magical element to these characters. My own ommitance to do this in the early stages led to a lot of re-plotting later on, which could have been avoided if only I’d asked a few questions beforehand: What can Buttercup do? What is he good at? What is his back story? How does he know Dorothy? Once I’d asked and answered these questions, I could go back over the plot and make it a lot tighter, and make sure that all the strands ran together nicely. Given that this is the first of a series, I know which way round I’ll be doing things for the next one! I know we all have our own way of writing, and what works for you works for you. Personally, I like to mess things up a bit sometimes and approach a new story in a completely different way to normal. But I know now that for me, if I don’t develop my characters properly early on, my plot won’t stand up either. My drawing doesn’t extend much beyond stick-men, so I cut out pictures of people from weekend supplements (not the young and beautiful, but the different and interesting). When I need a character I sift through the pile and find the one that is closest – that’s my beginning. I build the rest from there. What a fanastic idea. Yes, the interesting people pics are the good ones aren’t they? Their faces and appearance almost tell a story straight away. Thanks Jo. Super post, Abi. Love the illustrations for Ruby & Grub. What you wrote took me back to childhood – I used to spend days with my catalogue people (what a lonely child!). I would make entire communities – families, brownie groups, school classes, friends, etc – & on the back of each write their details as you do on your index cards. Maybe my young me is trying to tell me s/thing! So perhaps I should get a Littlewoods catalogue again! I can see how by spending so much time on char dev – as frustrating as it is & you want to let your fingers loose on the keyboard – the story almost tells itself. Great, sensible way to work. How organised of you! Thank you for sharing it. With the 2 MSs I’ve done I’ve had a basic outline & as I get to know characters (too impatient!) I think how they would react to a situation, tweaking as I go THROUGHOUT and not just at the beginning, so that no major plot errors occur. I tend to keep it all in my head. No wonder I’m scatty in real life. Hi Abi, I’m not sure how I went about writing my first book. I had the idea, the ending and went from there. I can’t/don’t plot, I feel it’s better to go along and see what you find. As for characters, I really can’t see them at all but I do get to know what they’d say and what they’d think and feel. @Jo Carroll, I like the idea of finding characters in magazines, might try that. Thanks for commenting Martin. I know I am a very visual person, which I think contributes to why I’m a slow reader, because I have to picture everything for it to make sense. So yes, I can see that drawing things, while it helps me, wouldn’t necessarily work for everyone else. Jo’s idea may well work for you then – a good excuse to buy magazines too. Sorry, me again! Last one I promise. I love that you draw out maps to figure it all out in your head. This is so like me aswell. And by drawing it all out it appears sorted and organised in your brain. I’m a strong visual learner too and a slow reader – not thought about the connection before. Maybe I’d better give those cut up index cards a go if my brain works in a similar way to yours. I think what you suggest about mixing it up is a great idea. If you stick to one thing how do you know there’s not an even better method that might work for you. You’re not an Aquarian by any chance, are you?! Brilliant post as always – and you sound like my character-building twin! I do all these things, and often hunt for photos on the internet of people who I imagine my characters to look like, too. It’s so important to know in advance how your characters are going to react to different situations and people, and whenever I run into plot problems, it’s often because I haven’t researched my characters in enough detail – another thing we seem to have in common! My stories also unfold in my head like films, and sometimes have problems with working out what to describe and what to leave out, as I ‘see’ the scenes I’m writing in so much detail. Emma, you are my writing double, so, of course, I agree with everything you’ve said. Yes, undefined characters really do lead to plot problems later don’t they, as we’ve both found out. It’s interesting that your scenes unfold in your head too. One of the good things about this, I think, is that you can see if they work or not even before you’ve written a word – quite handy that! Thanks so much for commenting. This is so helpful! I always write down physical characteristics and other details about my characters, but I like the way you take it one step forward and ask questions — and you give really good ones to start with. Great help!